Welcome to the Bible reading plan for the last chapter of the book of James! Congratulations on making it all the way through the book! I hope that this has been a great experience for you and your child and that it has helped both of you grow in your relationship with each other and your relationship with Jesus! Well, you know how to do this by now, so let’s just jump right in to JAMES CHAPTER FIVE! ___ Day Three: Matthew 19:23-26. Before you read these verses, play a game of “limbo” with your child. Hold a stick up and have him crawl under it with only his feet touching the ground. Continually lower the stick until he can no longer make it under. Then say: It was hard for you to get under this stick, wasn’t it? Imagine if you were a really big animal like a camel! It would be REALLY hard for you to get under the stick then, wouldn’t it? Listen to these verses. Read the verses. Then say, Does this mean rich people can’t get into heaven? NO! The rich can get into heaven – it is just sometimes really hard because some people love their money more than Jesus! How can we be sure that we don’t love our money more than we love Jesus? Go through your child’s possessions with him and help him choose some to give away. ___ Day Four: 1 Timothy 6:6-8. Spend time today teaching your child to be content with what he has! Help him make a list of all the things that God has blessed him with. Then spend time thanking God for making it possible for him to have all those things. ___ Day Five: James 5:1-3. Make a piggy bank and start saving money to give to a charity or mission organization. ___ Day One: James 5:4-6. Play a game of “Marco/Polo” with your child. One of you is blindfolded and the other is not. The one who is blindfolded calls out, “Marco!” and the other one replies with “Polo”. The one who is blindfolded tries to find the other person and tag him. When you finish playing this game, say: You had to listen in order to hear me cry out, didn’t you? But you heard my cries and were able to find me! Today’s verses tell us that God hears the cries of those who hurt, too. He hears us and He wants to help! Listen to the verses. Read James 5:4-6. ___ Day Three: Luke 23:44-47, Luke 24:1-7. Jesus was a righteous man who was condemned and put to death without resisting, just like James 5:6 talks about. Today you read about His death and resurrection. Make resurrection rolls to emphasize that He rose from the dead! Take a tube of crescent rolls and a marshmallow. Roll the marshmallow in melted butter and brown sugar or a sugar-cinnamon mix. Then place the marshmallow in the center of one of the crescent rolls and seal the marshmallow in. Cook according to instructions. When you take the crescent rolls out of the oven, what happened to the marshmallow? It is gone – just like Jesus is no longer in the tomb! Jesus rose from the dead! Celebrate as you eat your snack together. ___ Day Four: 1 John 3:16-18 How can we show others that the love of Jesus is in us? How can we help those around us who are hurting? Give your child a bunch of band-aids and let him decorate them with ways that he can help the people around him who are hurting. Have him put some of them on his own body to remind him that he is called by God to help those around him who are hurting! ___ Day Five: James 5:4-6. Have a campfire and roast marshmallows to remind you of how God called to Moses out of a burning bush. Invite another family over and share the love of Christ with them while eating s’mores! ___ Day One: James 5:7-8. Jesus is coming soon! We need to wait for Him patiently . . . just like a farmer waits for his seeds to grow into plants! Take your child outside and plant sunflowers. Then watch the sunflowers as they grow throughout the summer . . . reminding him of today’s lesson every time you see the sunflower! Try making a homemade lava lamp with your child! ___ Day Four: 2 Peter 3:8-10. We have been waiting for Jesus to return for a LONG time, but Jesus WILL keep His promise and He WILL come back! He is only waiting because He wants more and more people to follow Him! Spend time today praying for someone you know who is not yet a follower of Jesus. Then make a card for this person and send it out! ___ Day Five: James 5:7-8. Make one of the crafts or color one of the pages found here. ___ Day One: James 5:9-11. Have your child try to run in place while you read through these verses. Say: Sometimes it can be hard to keep going. We want to stop because we get tired or sad. However, we need to keep serving Jesus, NO MATTER WHAT . . . . just like you need to keep running in place while I am talking! See how long your child can run in place while you talk about what it means to endure. Help your child think of someone he knows who is suffering — perhaps a friend who is sick or someone who has lost a loved one. Help your child make a card for that person. Add a gift card to a local restaurant or grocery store and then send it out. Pray for that person to be able to endure through his suffering. ___ Day Three: Matthew 21:33-39 This is a story that Jesus told that stands for something else. Can you figure out who Jesus is talking about? Jesus is talking about how God sent His prophets to the people, but they didn’t want to listen and they hurt the prophets. Finally, God sent JESUS, but they killed Him. Do you know why Jesus died? He died to save US from our sins!!! Make a cross fingerprint craft with your family. Frame it and hang it in your house to remind you of the sacrifice that Jesus made for you! ___ Day Four: Revelation 21:1-7. We might have to suffer here on earth for awhile, but one day we will be in heaven with Jesus! There will be no more crying – in fact, He Himself will wipe the tears from our eyes! That’s wonderful news, isn’t it? Celebrate the fact that we will one day be in heaven! Make your own noisemakers and march through the house celebrating! ___ Day Five: James 5:9-11. Let’s celebrate the fact that one day we will be with Jesus in heaven again today! Make these cool streets of gold jello snacks! ___ Day One: James 5:12 We need to be careful what we say! Draw a picture of a mouth on a piece of paper. Have your child fill the mouth with pictures or words of they types of things that he should say. ___ Day Two: Exodus 20:7. What does it mean to take the Lord’s name in vain? Why do you think God doesn’t want us doing that? Teach your child how to spell the name of Jesus today! Help him write the name in his best handwriting and talk to him about how special that name is. Then make bubble letters to spell out the name of Jesus and let your child decorate the name. Glue it on construction paper for a frame! ___ Day Three: Matthew 5:33-37. Take a 2 liter of diet cola and a roll of mentos candy. Set the 2 liter up on a chair or table. (Make sure you are somewhere where you don’t mind if it gets messy!!) Unroll the mentos and take them out one at a time. Say: We are going to pretend that the mentos are the words that we say. The words we say can be good words or bad words. What are some good words that we might say? Discuss. Those are some great words we can say, but what happens when we say bad words? What happens when we try to sound “cool” by using words that God wouldn’t want us to say? Let’s pretend the mentos are the bad words we say. Let’s see what happens. Toss the mentos into the diet cola. Watch out! You should have a huge explosion. Discuss how our bad words can create a mess around us that is not easily cleaned up. We need to make sure our words are not making a mess! ___ Day Four: 1 Peter 3:10-11. How can you keep your tongue from evil? Make a fun mouth snack with your child to help him remember the importance of the words we say! ___ Day Five: James 5:12. Take a picture of your child. Print it out on 8 by 10 paper and cut out the face. Then glue the face over a paper bag so your child can make his own puppet . . . one that looks just like him! Have your child use that puppet to practice saying words that are good! ___ Day One: James 5:13-15. These verses tell us how we can PRAY all the time! 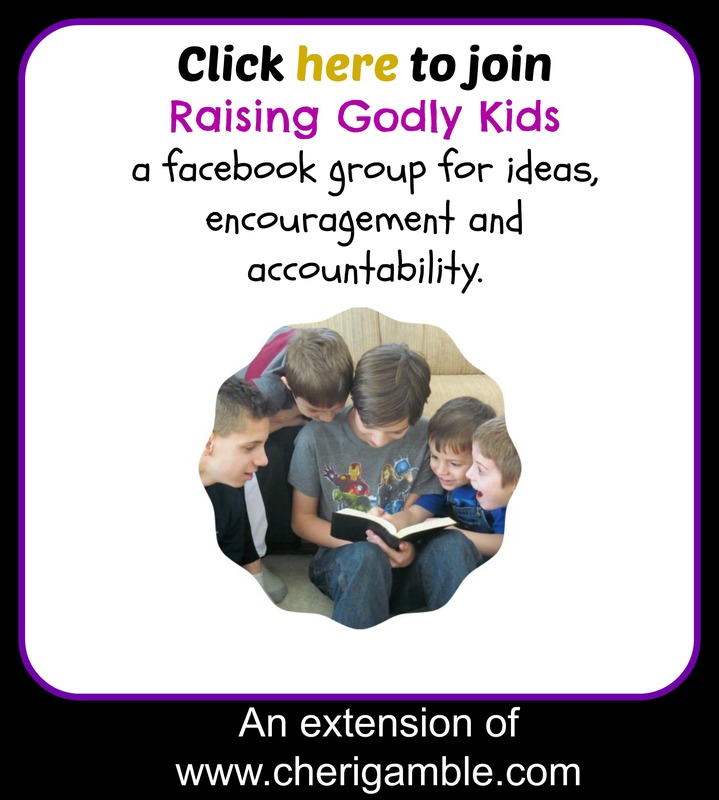 Use this week to teach your child more about prayer! You can start by helping your child make a prayer basket! Take an old can and cover it with construction paper. Then let your child decorate the construction paper however he wants (encourage him to make it have something to do with prayer!). Give him several craft sticks and help him write the names of people that he wants to pray for on the sticks (one name for each stick). Put those in the can and then have him draw one stick out each day this week and pray for that person. ___ Day Two: 2 Kings 20:1-5. What did Hezekiah do when he was sick? He prayed!!! Pray for someone who is sick today! Then make a card for that person, letting him know that you prayed for him! ___ Day Three: Luke 11:1-4. Did you notice that even Jesus prayed? Praying is important!!! Put together a prayer book for the Lord’s prayer. This is a great resource to help with that. ___ Day Four: Psalm 150. What are all the different ways that we can praise God that you see listed in this Scripture? Can you think of any other way to praise God? So . . . let’s DO it! Praise God in as many ways as you can!!! Make your own instrument and sing along! ___ Day Five: James 5:13-15. Make a prayer craft with your child. ___ Day One: James 5:16-18. These verses tell us how powerful our prayers can be! What did Elijah do through his prayers? Make a rainy day craft with your child to help remind him of the power of prayer! Make a fun snack to remind you of this passage! Use giant marshmallows to make the altar, then add pretzel sticks for the wood. Finally, add red and yellow fruit roll ups for the flames! Have your child retell the story and then eat the snack! ___ Day Three: Matthew 17:19-20. Find a mustard seed (or other small seed) and use it to explain this passage to your child. This seed is very small, but it can grow great things! Your faith might be very small, but it can grow great things, too!Decorate a pot and then plant a seed together and watch it grow . . . talking about how your faith can grow, too! ___ Day Four: 1 Thessalonians 5:17. This verse tells us that we can pray ALL THE TIME and ANYWHERE WE ARE!!! Make this prayer craft today. For some creative ideas on how to do pray continually, see https://cherigamble.com/2014/06/04/pray-continually-15-ways-to-practice-1-thessalonians-517/. ___ Day Five: James 5:16-18. If it is raining outside, run outside and talk about these verses in the rain! If it is not raining, turn the sprinkler on and run through the sprinkler while talking about these verses and rejoicing in the fact that God answers prayer! ___ Day One: James 5:19-20. We want to be sure to tell people about Jesus! God’s love covers all of our sins! Make a heart craft with your child to help him remember to love others! Cut a heart out of construction paper and let your child decorate the heart with whatever you have on hand – stickers, buttons, puzzle pieces, ribbon, markers . . . let your child be creative! As he is working, talk to him about how we need to love others and tell them about Jesus! ___ Day Two: 2 Samuel 12:1-7. In these verses, Nathan is confronting David about a sin that David had committed. Nathan uses a story to point out David’s sin. Sometimes people do wrong things and we need to point it out to them. We need to do this, always loving that person and letting that person know that he is loved! This concept might be difficult for your child to understand, so focus on the fact that we need to love others, and sometimes loving others means that we tell them the truth when they do something wrong. Make a sheep hand craft with your child. Paint your child’s hand white and have him press his hand on a piece of black paper to make a sheep. Let your child add anything he wants to the picture after the paint dries. ___ Day Three: Matthew 18:15-20. These verses talk about the Biblical steps to confrontation – again, a difficult concept for young children. Discuss it with your child and then remind him that when he does something wrong, Jesus will forgive him! Make this cool craft with your child to remind him of the way that Jesus forgives us when we sin! ___ Day Four: James 5:19-20. Make heart sugar cookies to remind you of the love Jesus has for you . . . that even when you sin, He forgives you and wants you to be His child!